Unrealized Profit - What Does It Mean? What is an "unrealized profit"? 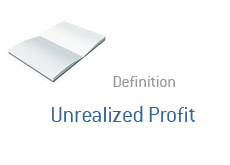 What is the definition of an "unrealized profit"? An "unrealized profit" occurs when an asset is purchased and then rises in value, but hasn't been sold. A "realized profit", on the other hand, occurs when an asset is purchased and then sold for a higher price, thus resulting in a profit. Example #1: John Smith buys 1,000 shares of AAPL at $225 per share. AAPL announces strong Q1 earnings and the stock trades up to $245 on the news. John Smith decides that he isn't going to sell as of yet, because he believes that the stock is going to at least $300. John Smith now has an "unrealized profit" on AAPL of $2,000 ($20/share x 1,000 share position) because his position is profitable, but he hasn't sold. Example #2: Jane Plain purchases a house for $350,000. Over the course of three years, real estate values in the area rise and Jane's house is appraised at $450,000. Jane, who has no intentions of selling her home, now has an "unrealized profit" of $100,000. Jane would have to sell her home to have a "realized profit".